Wholesale Prices Retreat From Record High - Cox Automotive Inc.
Wholesale used vehicle prices (on a mix-, mileage-, and seasonally adjusted basis) decreased 1.32 percent month-over-month in November. 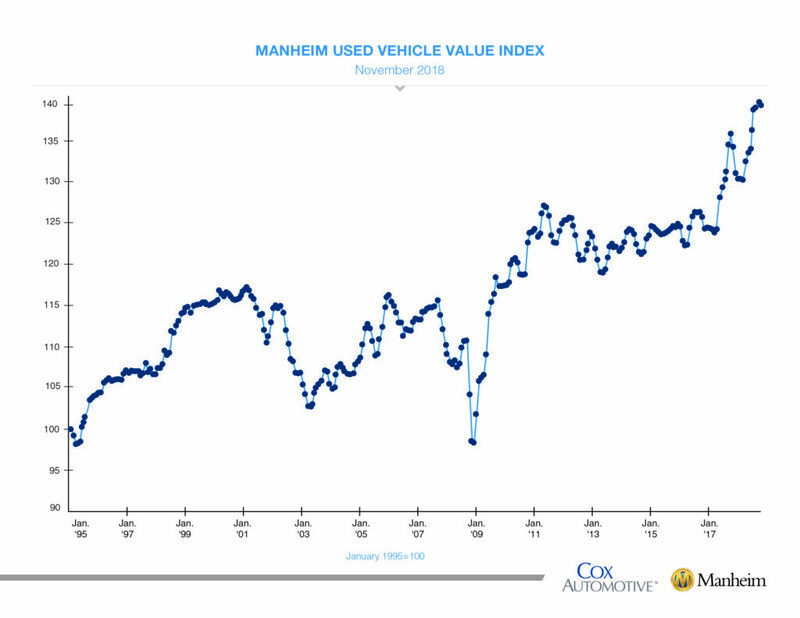 This brought the Manheim Used Vehicle Value Index to 139.0, a 3.3 percent increase from a year ago. 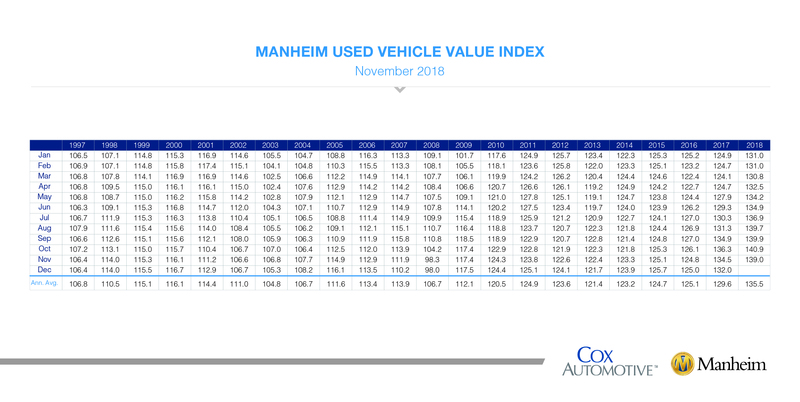 Looking at trends in weekly Manheim Market Report (MMR) prices, November saw continued normalizing depreciation. Three-year-old vehicles ended the month worth 2.7 percent more than they would normally have been worth had typical depreciation occurred instead of the abnormal appreciation observed this summer. 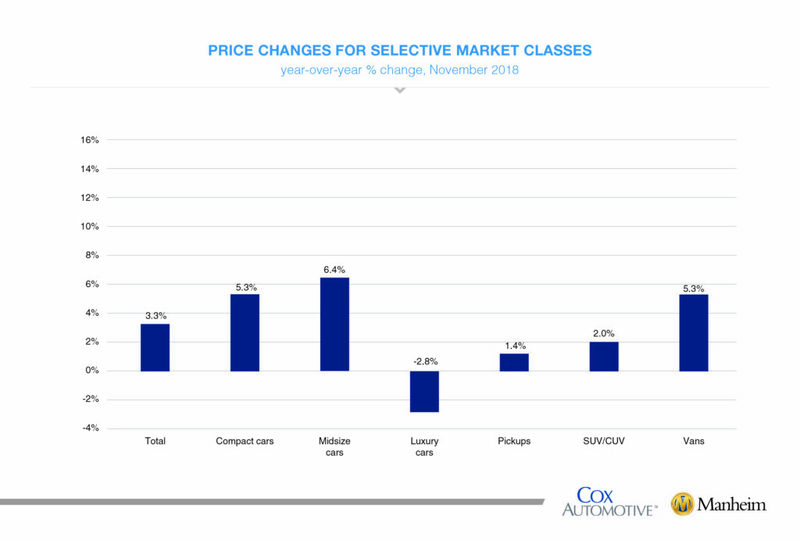 On a year-over-year basis, most major market segments saw price gains in November; but more affordable vehicles continue to see the greatest increase in values. Compact cars and midsize cars outperformed the overall market, while utility vehicles and pickups underperformed the overall market. Mixed results for retail vehicle sales in November. According to Cox Automotive estimates, used vehicle sales volume was up 0.8 percent year-over-year in November. The annualized pace of used vehicle sales was up almost 1 percent over last year, led by franchised used vehicle sales (up 1 percent in November on an annualized basis) and private-party used vehicle sales (up 2 percent in November on an annualized basis). We estimate the November used SAAR to be 40.1 million, up slightly from 39.8 million last November. November new vehicle sales were down 0.7 percent year-over-year, with the same number of selling days compared to November 2017. The November SAAR came in at 17.4 million, down versus last year’s 17.5 million. Cars continue to see sharp declines, as sales in November fell 14 percent compared to last year. The market share for cars fell to 28.8 percent, which is the lowest monthly share on record. Light trucks outperformed cars in November and were up 6 percent year-over-year. New vehicle sales year-to-date are up less than 1 percent versus last year. Fleet has been the driver of the strength in the new vehicle market year-to-date. Combined rental, commercial, and government purchases of new vehicles were up 9.5 percent year-over-year in November even though fleet sales were flat on a month-over-month basis. Commercial (+18 percent), rental (+6 percent), and government (+5 percent) fleet channels were up year-over-year in November. Fleet sales are up 7 percent year-to-date versus last year. New vehicle retail sales were down 2 percent in November leading to a retail SAAR of 14.8, down from 15.2 last November. Retail sales are down 1 percent year-to-date versus last year. New vehicle inventories came in under 4 million units for the seventh consecutive month, but inventory levels are at their highest level since April 2018. Rental risk pricing strengthens. The average price for rental risk units sold at auction in November was up 3 percent year-over-year. Rental risk prices were down 3 percent compared to October. Average mileage for rental risk units in November (at 47,000 miles) was up 7 percent compared to a year ago and up 1 percent month-over-month. Strong economic performance behind, concerns growing. The pace of real economic growth in the third quarter as measured by GDP was unrevised in the second estimate and remained at a robust 3.5 percent. Consumer Confidence, as measured by the Conference Board, fell 1.6 percent in November to 136 from an 18-year high in October. The consumer’s view of the economy is starting to decline as worries about interest rates and a volatile stock market begin to grow.